© Isabel Cole Isabel Fargo Cole grew up in New York City and studied at the University of Chicago; since 1995 she has lived in Berlin as a writer and translator. 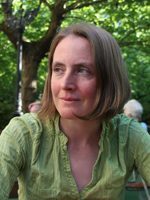 In 2006 she co-founded www.no-mans-land.org, the online journal of new German literature in translation. In 2013 she received a PEN/Heim Translation Fund Award to translate Franz Fühmann’s At the Burning Abyss for Seagull Books, and in 2014 her translation of Fühmann’s The Jew Car was shortlisted for the Oxford-Weidenfeld Translation Prize. Why did you choose to become a translator? Is it the profession you always wanted? I began taking German in high school; we had an outstanding teacher, Gisela Rummel, who made it exciting to communicate in a new language, and introduced us early on to works of German literature. What I really wanted to be was a writer. I never considered translation as a career until I came to Berlin in 1995, initially to study, and realized I had no marketable skills but my language ability. Academics at the university were often looking for native speakers to translate papers into English, which was how I got into translation as a bread-and-butter job. At the same time, I kept discovering wonderful German writers and realizing that most of them had barely been translated – the thrill of discovery and the desire to share the reading experience inspired me to start translating samples of books and seeking publishers. I also found the activity of literary translation helpful to me as a writer. Which German book do you like the best and why? Of course this is an impossible question! There are areas of German literature I have a particular interest in, like non-conformist East German literature (especially the work of Franz Fühmann and Wolfgang Hilbig), and literature by the many Weimar-era writers who slipped into obscurity in the upheavals of World War II, and literature from the Romantic period. And apart from pure intellectual interest, of course there are books that have been especially intense or enjoyable reading experiences, but it’s hard to single out just a few. Generally my favorite book is whichever one I happen to be translating at the moment, because I’m lucky enough to pick my projects – or, in the case of Among the Bieresch, my publisher happened to offer me a book that in its utter self-contained strangeness seemed like exactly the book I’d been waiting to read. Is there a particular book you would like to translate? Among other things, I would like to continue translating Wolfgang Hilbig and Franz Fühmann. I’d love to do a collection of Fühmann’s exquisite and very adult retellings of Greek myths.